I have been twisting this recipe on The Potato Soup by adding in some parsnips, as I had some left over of parsnips after making this pumpkin soup with parsnips and potato. I also decided to boost the serving by adding in some fried bacon. This soup is another simple soup to make. 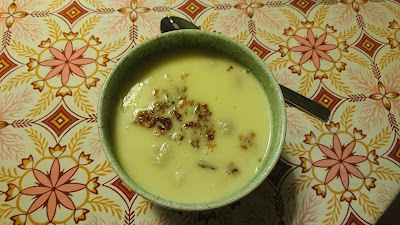 The original potato soup has been one of my favourite recipe for close to 40 years !!! Peel the potatoes, parsnips, onion and garlic. Cut those into smaller pieces. Meanwhile roughly chopped the bacon and fry it.